As the summer starts to creep to an end, I realize that I haven’t shared any of my ice cream recipes that I made with my ice cream maker this summer. Knowing that not everyone has an ice cream maker, I continued to put off sharing them because they would not be as useful to most readers. I guess it’s now or never at this point, right? Then again, I can eat ice cream during any season! Making your own ice cream is great because you can control what goes into it. I guess that’s really true for anything you do homemade, but I feel like ice cream with real ingredients these days is hard to come by. 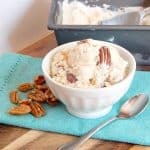 This Homemade Maple Pecan Ice Cream is certainly my favorite of all the recipes I have tried with my ice cream machine so far. To be honest, you can use this as a base recipe for a vanilla ice cream and then add any ingredients you would like to dress it up. I am a big fan of all ice creams that include caramel, pecans, and anything buttery and rich. The maple pecan combination hit the spot for that sort of craving. There is an option for dairy free and dairy versions for this recipe. I tried both and enjoyed them each. Once I even added a tsp of cinnamon to the pecans and that was icing on the cake for me! I was also pretty weirded out by adding the vodka at first after searching for ways to keep the ice cream from getting rock hard. After trying it, it proved quite handy. Making this ice cream really doesn’t take a whole lot of time, but if you do have it, I recommend chilling the ice cream mixture for at least 4-5 hours before churning. This makes a difference for sure. So enjoy these last days of summer before school, or if you are in Cincinnati, most schools went back today so maybe you need ice cream to celebrate! Make sure your ice cream machine bowl is frozen overnight. Stir all ingredients for pecans so that all pecans are evenly coated. Bake for about 15-20 minutes on a parchment paper lined baking sheet. Transfer ice cream mixture into maker and allow to churn for 15-20 minutes or until it begins to thicken to a soft serve consistency. A minute before you are ready to turn off the machine, add the pecans. Serve immediately or if you prefer your ice cream to be less like soft serve then freeze in a container for about 1-2 hours. Chocolate fan? Toss in some dark chocolate chips as well! Adding vodka allows you to let this set in the freezer overnight and then be able to spoon it out with more ease. Without it, the ice creams becomes very hard.